One of my favorite things during a road trip is to watch road signs for exit attractions. More specifically, I’m searching for the museums. Not because I actually want to take a side trip to visit one (does anyone actually do that), but because there are some amusing/fascinating/are-you-kidding-me kind of museums out there. Along my travels, I’ve seen signs for the Salt Museum, the Water Tower Art Museum, the Crime and Punishment Museum (among others). 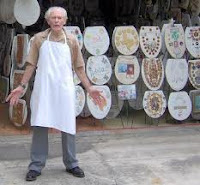 Just doing a simple Google search for this blog, I came across the Antique Hair Museum (Indiana); Merry Go Round Museum (Ohio); The National Museum of Funeral History (Texas); The Museum of Bad Art (Massachusetts); The Museum of Questionable Medical Devices (Minnesota); Toilet Seat Art Museum (Texas). I might have to take a trip to that medical museum—I’m very curious. And the bad art museum? Can you imagine telling friends your art made it into a museum, then revealing it’s the bad art museum? I’m laughing just imagining it. I love those museums. Sometimes they are so "dark" looking that you just have to go in. One of the most fascinating museums I've ever seen is the pharmacological museum in New Orleans. Imagine the days of Ether and ground drugs in large, brown bottles. You should have seen the dentistry equipment....errrr...,gives me the shivers! Too funny! I aqree the best part of road trips are seeing signs..unusual musuems, funny street names, signs with improper grammar! I love it! All the museums you mentioned shound fun except I think I would have to pass on the Antique Hair Museum...ewww! There's a cool little museum at the Bunker Hill Monument in Boston. It has a diorama of the battle with an audio re-enactment that's very effective. Seriously great museums would have to include the US Air Force Museum in Ohio. One of the interesting museums that I've visited was the Underground Museum in Seattle. How about the Mutter Museum in Philadelphia? It's devoted to mainly 19th century medical curiosities (mostly weird deformities). The displays include two saponified corpses--that's when they turn into wax. All sorts of interesting stuff! And here I've lived in Texas all of my life and never visited these! Putting them on the to do list. I don't go to a lot of museums, both those you listed sure do sound interesting. For a school project I went to the Museum of Man here in San Diego, and by going there I got a free ticket to see a traveling exhibit in the hall next door. It was all on different torture/means of punishment used throughout the ages. My husband was with me and after a while of walking around the exhibit, we both started to feel sick so we left. Truly amazing the horrifying ways people thought of to punish/torture people. Ugh! Heather, next time you come out to DC, go visit the Spy Museum. It has some very interesting exhibits and even a "Spy City Tour" on Saturdays. I plan to go on the tour soon, sounds like fun!!! Odd museums have always been a sight to see on trips for my family. One of the best is still operating in Dover Ohio - The Warther Carving Museum & Button Collection. Mr. Warther learned out to whittle pliers out of a matchstick & then decided to see how many he could carve out of a single piece of wood with each plier handle have another plier carved out of it. His Plier Tree is at the museum with 511 pliers carved from the single piece of wood. He also carved beautiul train replicas including the Lincoln train. As a bonus on the sight is his wife's collection of over 73,000 buttons arranged in square quilt patterns. This museum is worth a special trip. I have also seen many others including a medical oddities museum and the Corn Palace. The corn palace! Too funny. I'll make a note of the Spy Museum next time I'm in the DC area. One of my favorite museums, nothing strange about it, is the Natural History Museum in DC. I love the gem/mineral exhibit. I'm not much of a jewelry person but the stones are so pretty! I could spend all day in there. Well, if it wasn't so crowded. Also, I think there's a Dr Pepper Museum in Texas, too. I think it's time for a visit. Yum, yum! I am a huge fan of stopping for the largest ball of twine, the house made of all soda bottles, all that jazz. I alwyas try to pad my road trip schedule with a little extra time to stop at interesting places along the way. My favorite unplanned stop was at Frank Lloyd Wright's House in the Rock near Madison, WI. Wow, what a fabulous place! If I were married to someone other than Mr. Drive-Straight-Through, I would stop at all of them. And probably never get anywhere. I need to take road trips with someone who wants to stop all the time! And will do all the driving. Come visit me, and I promise you a trip to the Creationist Museum at Dinosaur Park AND to the Cowgirl Museum. That's the kind of friend I am. Ahem. That's House on the Rock, and it's actually in Spring Green, WI (west of Madison). In addition to a number of "real" museums in the Madison area, we also have the Mustard Museum. I have actually seen the Corn Palace in South Dakota. Only the outside murals done in corn, not the inside tour, and it was actually pretty impresive.